Probably not, unless [Clayton Darwin]’s mandolin playing pluck-bot has anything to say about it. The pick-wielding delta-ish robot can be seen in action in the video below, plucking out the iconic opening measures of that 70s prom-theme favorite, “Colour My World.” The robot consists of two stepper motors connected to a hinged wooden arm by two pushrods. We had to slow the video down to catch the motion, but it looks like [Clayton] has worked out the kinematics so that the pick can be positioned in front of any of the mandolin’s eight strings. A quick move of the lower stepper then flicks the pick across a string and plucks it. [Clayton] goes into some detail about how he built the motion-control part in an earlier video; he also proves that steppers are better musicians than we’ll ever be with a little “Axel F” break. It’s only a beginning, of course, but the complexity of the kinematics just goes to show how simple playing an instrument isn’t. Unless, of course, you unleash an endless waterfall of marbles on the problem. Lockpicking has become a trademark skill of hackers all across the world, and is regularly taught at hackerspaces and maker faires. But a lot of the time, the sets have already been made or bought online somewhere. However, [Sean] has demonstrated how to create a lock picking set with ordinary paperclips in the video embedded at the end of this post. Wikihow also has these awesome instructions on how to build them. What’s great is that the material for these picks are easily found. There are other ways to fashion a set together. For example, street sweeper bristles can be used. And electrical metal tape is a good material as well, but these paperclip sets are, by far, the most accessible. Pretty much anywhere that has office stationary supplies will have mounds of these little metal clips lying around. But how well do they work? Have you made a paperclip lock picking set before? If so, let us know in the comments, and tell us how well they did. The Stimmmopped is an electronic guitar tuner made to be used as a guitar pick. This uses two LEDs synchronized to blink at the exact frequency of the string you are tuning. Pluck the string with the corner of the PCB and then shine the light on the string you are tuning. As the vibrating string moves back and forth it will only pick up the spot of light when the frequency matches that of the blinking LED. Once in tune, both red lights will appear to be constantly illuminated and immobile on the string. An Atmel ATmega8 is used to control the device, interfacing with two buttons and a seven-segment display to choose the pitch currently being tuned. Gibson has a robotic guitar that features an auto-tuning mode, but if you don’t want to shell that much this low cost and simple build is for you. 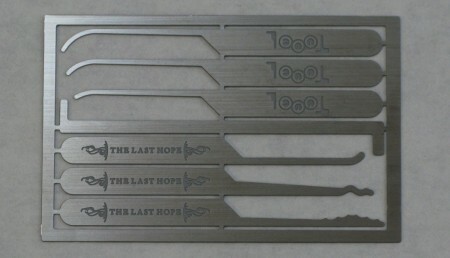 Speaking of laser engraving, the blackbag blog announced that Toool has designed 2 unique picksets for The Last HOPE this year. First is the credit card sized snap-off set seen above. They have named this one The Last HOPE emergency pickset. The other pickset is a new version of the ‘double sided pick’ series. This set consists of picks with the same tool on either end, but they are sized differently. This set will contain 8 picks with promised improvements. If you are interested in more complex picks, check out the centipede.